Clutching Hand is a crime serial with Professor Craig Kennedy using his educated knowledge of chemistry and psychology. Arthur Reeve created the character Professor Craig Kennedy, also known as "The American Sherlock Holmes." 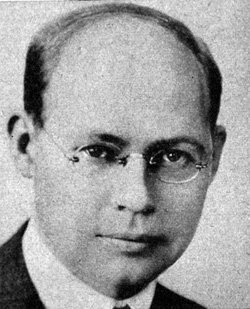 He even had a Dr Walton-type sidekick, a newspaper reporter named Walter Jameson. Most of the Craig Kenedy stories were published in Cosmopolitan Magazine in the 1910s. After graduating from Princeton, Reeve became a journalist interested in crime solving technology. After writing a few non-fiction articles on forensics, he created the character Professor Craig Kennedy who used some real scientific techniques and some imaginary to solve crime. During WWII, Reeve opened a crime detection laboratory in Washington, D.C. to further the science of crime fighting. 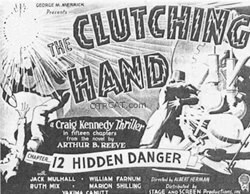 Clutching Hand is an early radio serial produced in 1936, although the exact airdates are unknown. A film serial by the same name was also produced in tandem to the radio serial in 1936. The plot follows the kidnapping of Professor Gironda who had discovered a way to make synthetic gold. There is a surprise twist at the end of this classic whodunit and you will never guess the mastermind behind The Clutching Hand. William Farnum (of The Adventures of Uncle Jimmy) played the role of Inspector Gordon Gaunt. Be the first to comment on "Clutching Hand"